Partnering with a software consultancy has numerous benefits that can save you time, money, and stress while still putting out an excellent product. Finding the right partner, however, is the hardest part, as you want to make sure that the union is a perfect match for both parties before you get the wheels in motion. Before making a final decision, there are a few questions you should ask potential candidates that will clarify whether they mesh well with your project and your team. In other words, are they speaking your language? Not every software-development shop will have the same industry expertise. Most important if you work in a particularly niche industry, like drones for instance, having a partner with experience in your field is key to creating a high-quality product. This is cost-effective as well, as there’s no need for developers to spend hours learning a whole new domain; that’s supposed to be the benefit of hiring a software partner — outsourcing to an industry expert to avoid spending employee hours on training. Industry experience is a requirement on the most basic level, and all other components of your relationship (like project communication and implementation) will stem from there. 2. What is your development process like? Speaking of those other components, you’ll want to know how they typically work with clients in regards to planning, communication, collaboration, and project management and execution. Do they provide a timeline for the project? What’s their communication style and how will they ensure deadlines are being met? For example, at Upstate Interactive, we have a discovery process that includes onboarding clients, getting to know our new partners, developing buyer personas that match their goals, and eventually deliver a product-development roadmap — all of this to ensure all of the important items are addressed and we fully understand our client’s needs before we write a single line of code. We also build interactive prototypes, the most critical tool in our discovery process, which you can read more about here. 3. What level of support and involvement do you offer? Most companies partner with a software consultant because developing is not in their core expertise — it makes more sense to hire an expert to get the job done — but what happens when the project is complete? Will there be a point of contact available to assist with tech support? Will they offer training to employees to address common problems that may arise? If there are any bugs that need fixing, or updates are required, you’ll need to know whether there will be support available. Find out which days and times they are available to address support requests, and the window they will respond within. 4. Who will be assigned to our project? What will the partnering team look like and how will they work with your in-house staff? While it’s great to have partners working on location with you, do not discount a remote team as it can be just as successful. More importantly, find out whether they work collaboratively or on their own. Does their software-development staff have a product perspective or a project perspective? Ask for a point of contact to ensure streamlined communication, how many people will be assigned to your project, and how many other projects they are currently working on. 5. Do you have social proof? A reputable software-development partner will have case studies and references to back up their work. In the case studies, look for information about the challenges they faced and how they overcame them, as well as what did or didn’t work for the project. If there are no case studies, feel free to ask these questions on a phone call. Look for testimonials on their website, and don’t be afraid to ask for references as well. There’s nothing more comforting than not only finding a partner with expertise in your field, but also teaming up with one who that has proven success and rave reviews. 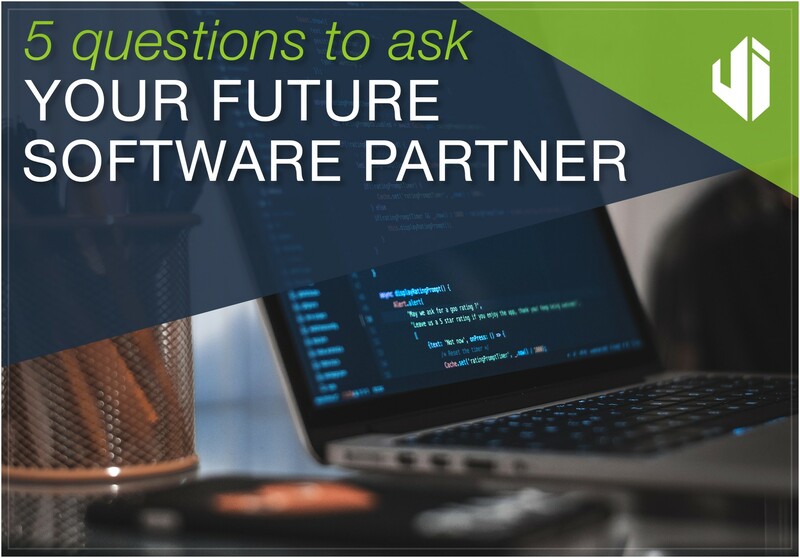 These questions are extremely important in determining the ideal software partner for your project’s needs, and are questions we are asked often when bringing new clients on board. The time spent interviewing candidates more in depth will be well worth the time saved once you have an experienced, efficient team working to bring your project to life. For more information on our consulting services, and to schedule a free consultation with a member of our team, click here.